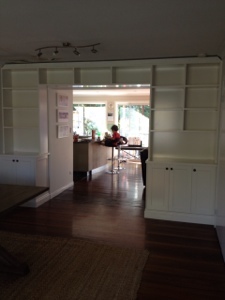 The bookcases finally where installed on Friday. 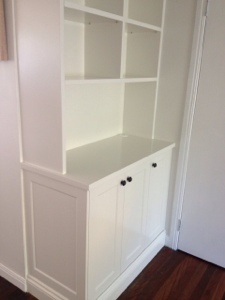 The guys from Maytain Cabinets did an absolutely brilliant job. 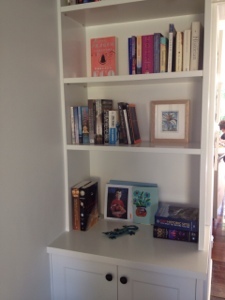 The bookcase itself is gorgeous and they left everything clean and tidy – they even bought in my rubbish bin! We quickly put our books up on Saturday, though I envisage a bit of rearranging in the future. I still have to have the new light fittings installed and the plasterer in to do the cornice and ceiling repair. It was great to finally get all our books out of the cupboard they’d been stored in since we moved. 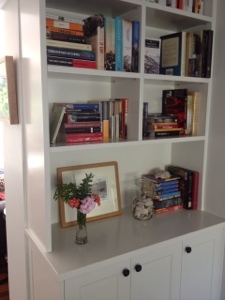 Nothing like books to add a bit of warmth and colour to a room. 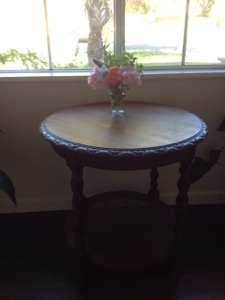 The boys surprised me with a little posey of flowers this morning from Grandma’s garden. They slept over last night so R and I walked up to our local Indian for a yummy meal and then went to Astro Pete’s for some stargazing and astronomy chat. I got to clearly see Saturn, it’s rings and two moons and some galaxies. I always find it immensely humbling and awe inspiring to stargaze. Time to get ready for our mothers day picnic at New Farm Park. Hope you all had a wonderful weekend and mothers day. 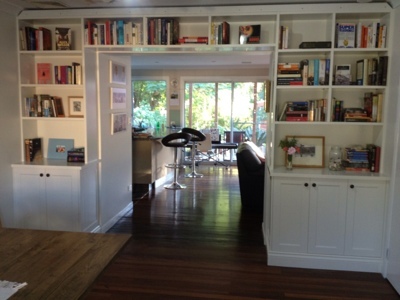 The bookcases are beautiful Ti! So nicely finished and lovely deep shelves. Your garden looks lovely through those windows in the next room… do you garden? I'd classify my garden as 'subtropical urban rainforest'. I have good intentions but never seem to get far. I spend most of my time just pruning it to keep it under control. We have running bamboo which grows at a ridiculous rate. Sounds idyllic to me! I love bamboo and the way it rustles in the breeze. Thankfully our garden is looking less like a swamp and more like a garden. Would love to have more time (and money!) to invest in it though..